The first time I had a piece of crystalized ginger, I immediately loved it; my imagination went a little wild as I thought of all the ways I could use it. Since then I’ve experimented with putting it in a variety of baked goods. I found out that it likes being “center stage”, without a lot of other ingredients to compete with. That way you get the full impact of its gingery, spicy, sweetness. 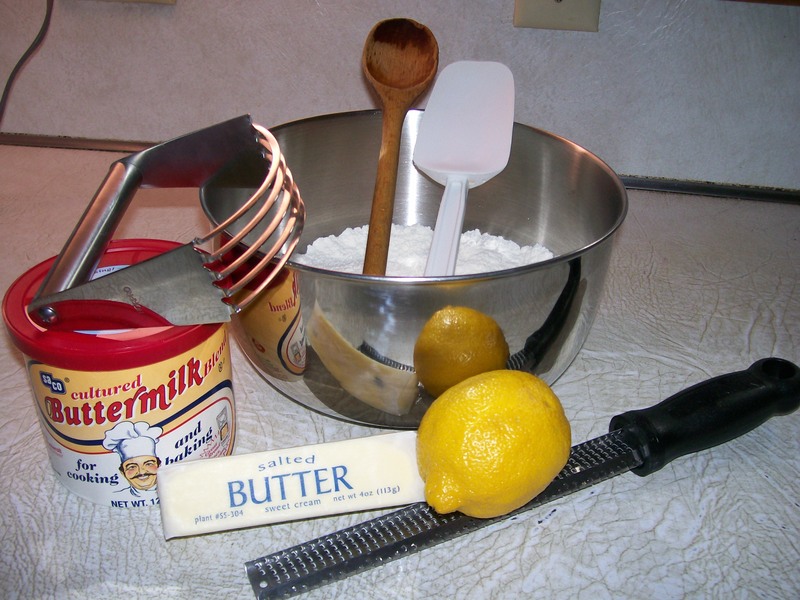 This recipe for scones with lemon and candied or crystalized ginger is a great example of that. It’s one of my favorites—I hope you like it too. Preheat oven to 400 degrees. Lightly grease baking sheet or line with parchment paper. Mix all dry ingredients together ( flour through salt) with a whisk. Cut in cold butter with pastry cutter or two knives. 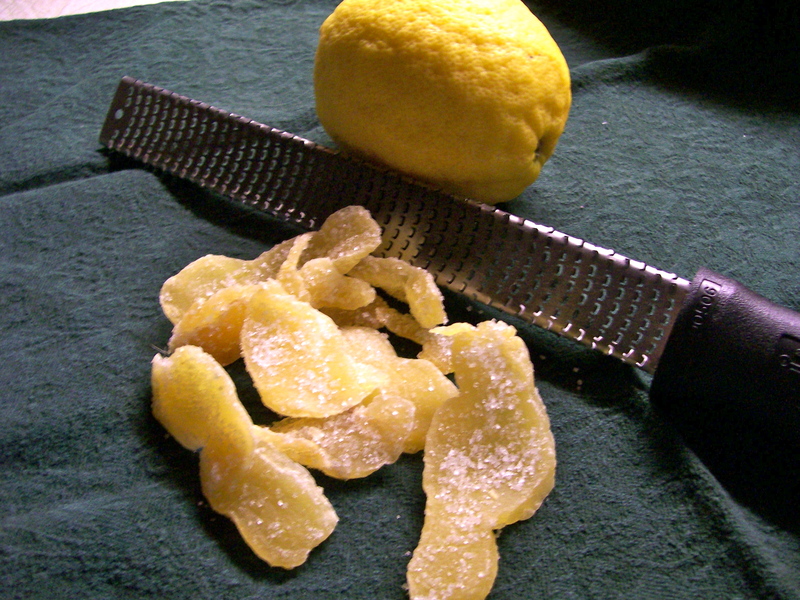 Stir in lemon zest and chopped ginger. Add buttermilk. Stir just to moisten. Turn out onto lightly floured board and knead gently to unify. With hands form into a disc about 7 inches round by 1 1/2 inches thick. 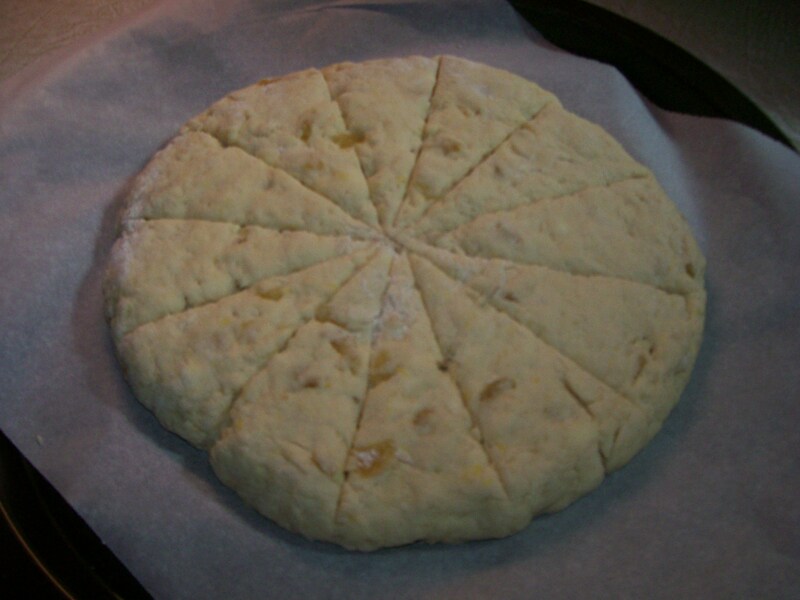 Cut into 6 large or 12 small triangles, and place on prepared baking sheet. Brush tops with egg wash ( I use a little Egg Beaters) and sprinkle with coarse sugar. Bake at 400 degrees for 20-25 minutes, or until golden brown and a toothpick tests clean. Serve warm with jam. I particularly like blackberry jam that I make in the summer when blackberry season comes around. I’ll save that story or another day!